I’m on a mission lately to empty out my freezer and use up all those random ingredients I have lingering in there. Every time I open the freezer door, I’m amazed at what I find. I hate to throw food out so if I’m pretty sure I won’t use something before it goes bad, I freeze it. Then I forget it until it’s no longer recognizable. This soup was quite frankly one of the best soups I think I’ve made. Like ever. It had a sweet spicy flavor and the lime juice was a great addition. Everything came together perfectly and because the squash and chicken were already cooked, it took about 10 minutes to make. You can’t beat that. Preheat a soup pot over medium heat and spray with non-stick spray. Saute the onion for about 5 minutes until softened but not browned. Add the curry paste, garlic and ginger and saute for another minute. Add the broth, stevia, squash, almond milk, and fish sauce. Bring to a boil and simmer for 5 minutes. Remove from heat and use a hand blender to carefully puree the soup. Make sure you don’t splash and burn yourself. You can also use a blender, Magic Bullet or food processor. After pureeing, stir in the peanut butter until blended. Ladle the soup into bowls and top with the chicken, cilantro and a squeeze of the lime slice. Makes 4 servings at 242 calories each – 27g protein, 18g carbs, and 7g fat. I had a few bags of frozen butternut squash left from the last time I cooked a squash. It made this recipe really easy to throw together. 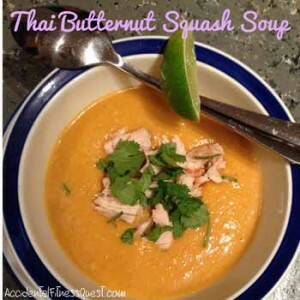 You can use frozen butternut squash puree or even canned if you prefer. Typically Thai food uses coconut milk, but I only had almond milk in the house. Get creative and use coconut milk, almond milk, regular milk, etc based on what you have and what your family likes. Why did I use a random amount (3/4 oz) of peanut butter? Because when we stayed at a hotel in Austin, they had little snack sized containers of peanut butter. I grabbed a couple of them off the breakfast buffet for a use such as this. Yes, I’m a peanut butter pack rat. I used a little bit of baking stevia to balance out the spicy red curry paste. You can use sugar in its place or leave it out if you like the taste without it. Vegetarians and vegans, you can use tofu cubes or tempeh in place of the grilled chicken and vegetable broth instead of chicken broth. Leave out the fish sauce and use a splash of tamari or soy sauce for the salty flavor. Now I just need to figure out what to do with the rest of the squash!